The Bananas infected with aids hoax is circulating the web. 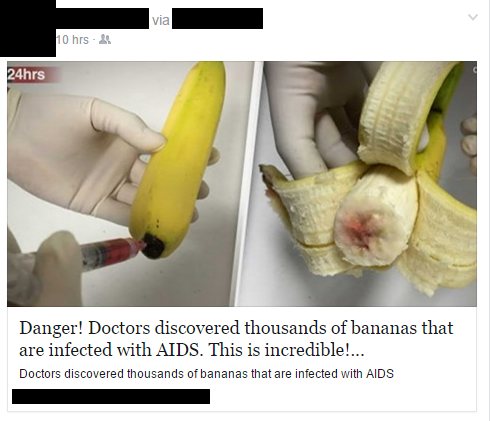 Beware of posts which claim that bananas have been infected with aids. The posts are hoaxes which are linking to malicious websites. Danger! Doctors discovered thousands of bananas that are infected with AIDS. This is incredible! Be careful. The bananas infected with aids hoax is currently circulating on Facebook and people are sharing the post because they think they are informing people to be aware of bananas which are infected with aids.